When you hear that the fourth shipment is selling out fast, you know it’s going to be one of the hottest items for little girls this Christmas. These delectably dreamy garments by Andrea Rembeck of Tutu Du Monde will be the pick of the presents for little girls all over. With their old-world style, muted colours and durability, they’ll see them through many an enchanted forest and days as a princess! The frou-frou is almost unbearably beautiful. The ‘Blossom’ and ‘Twinkle’ tutus feature silk rosettes encrusted with crystal beads. The ‘Butterfly’ top claims to be ‘sequinned with magic butterfly dust’ and also features feathers. Choose also from petticoats, fairy skirts and co-ordinating plain singlets. 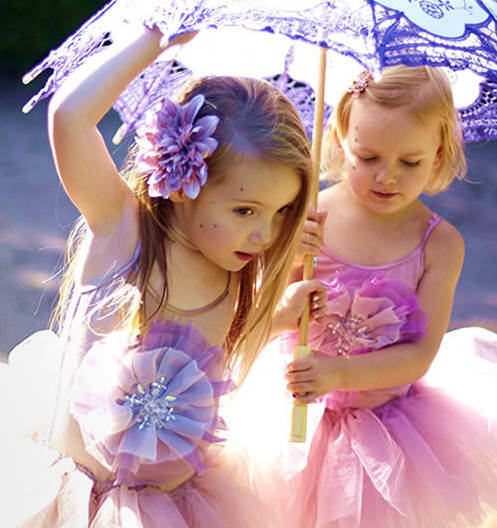 The most delightful pieces in the range are available from Kido Store, with prices starting at $59.95 for the Butterfly tops, and up to $149.95 for the Twinkle tutu.